Herman Wouk Signed PhotographHerman Wouk (1915 - ). Pulitzer prize winning novelist, wrote The Caine Mutiny, The Winds of War, and War and Remembrance. A Fine Early Massachusetts Land Transaction Signed by these three Promiment Massachusetts People John Weld, William Dudley and Samuel GerrishWilliam Dudley (1686 1743) a man of brilliant talents, which he exercised both in civil and military life. Free Love Advocate And Founder Of The Oneida Community, John Noyes, As Leader Of The Putney Bible School, Noyes First Communal CommunityJOHN NOYES (1811-1886) American utopian socialist. Revolutionary War Pay RollCONTINENTAL SOLDIERS FROM RHODE ISLAND Manuscript Document. Joseph Habersham, 3rd Postmaster General Of The United States Concerning Impropriety In The Postal ServiceJOSEPH HABERSHAM (1751-1815) American businessman, politician, soldier in the Continental Army, delegate to the Confederation Congress, and third U.S. Postmaster General. An Historic Letter Written To President Zachary Taylor Warning Him Of An Impending Assassination Attempt "I have always done my duty. James Monroe Signed Land Grant While Serving As PresidentJAMES MONROE (1758-1831). Fifth President of the United States. Elihu Burritt Elihu Burritt (1810 - 1879). American philianthropist and social advocate for international peace. Colonial Governor James DelanceyJAMES DELANCEY (1703-1760) Acting colonial governor of the Province of New York and a leading figure in the area's development. Oliver AmesOLIVER AMES (1831-1895) U.S. political figure who served as Governor of Massachusetts. Civil War General Eugene Carr Handwrites And Signs A CheckEUGENE A. CARR. ADS. 1pp. Simon Lake/ Boston Sand and Gravel Simon Lake was a famous American engineer who is responsible for obtaining over 200 patents for his advancements to naval designs. State of New York Certificate Of Audited Or Revised Claims For The War Of 1812 Signed By Frederick TownsendFrederick Townsend (18251897) was a Union officer in the American Civil War. General Post Office Circular signed twice by John McLeanJohn McLean (1785 1861). Supreme Court Justice and Postmaster General. W.K. Rogers Private Secretary To The President. Rhode Island Deputy GovernorJOSEPH WHIPPLE III. DS. 1 page. 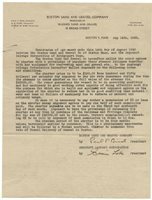 Otto KahnAn extraordinary letter in which banker OTTO KAHN writes to thank New York Judge George Ingraham for Releasing a presumed German Spy. John Trumbull Signs an Appointment of Mathew Talcott To Serve As Major In The "Sixth Regiment of Horse and Foot" In The Colony Of ConnecticutJonathan Trumbull (1710-1785). Wartime governor of Connecticut; Close friend of George Washington. Junius Spencer MorganJUNIUS SPENCER MORGAN (1813-1890) American financier and banker. William Duer - Signer of the Articles of ConfederationWilliam Duer Takes Control of Merchant Ship DUER, WILLIAM (1747-1799). Duer, a colonial merchant and financier, made money by owning New York forests and mills. Timothy Pickering Writes To John PickeringTIMOTHY PICKERING. ALS. 1pp. Benjamin Harrison Letter of State to the President of NicaraguaBenjamin Harrison Letter of State to the President of Nicaragua Announcing Richard Cutts Shannon as Minister Plenipotentiary and Envoy to the Republic of Nicaragua Benjamin Harrison (1833 1901). Twenty-third President of the United States. Lockheed Aircraft Company Stock Signed By Allan Loughead1929. 100 shares of the Lockheed Aircraft Company.